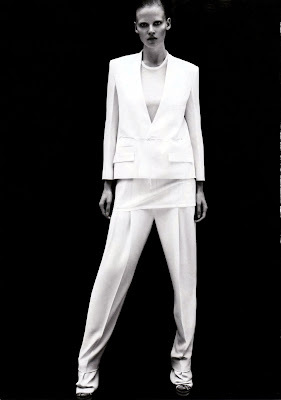 There have been a lot more entries and articles on Lara Stone in the new Calvin Klein Collection print advertisements. A lot of writers have said that the outfit doesn't fit her, or that the brand is using her based on her name/face. Personally, I think these ads are beautiful. The black and white effect brings out Lara Stone's beautiful features and really highlights how structured and unique the clothing is. Sadly, it seems that nowadays you cant really rely on a model's face or fame to sell clothing considering the world is obsessed with celebrities. You more frequently see celebrities getting endorcement deals before models, even though modeling is THEIR job. Paris Hilton (cliche example, but hey, I'm tired) can sell nearly anything she puts her name on because shes PARIS! If you asked most college girls who Lara Stone is, they probably wouldn't know. It seemed like models were making some sort of a comeback with red carpets, clothings lines, etc. but I think the public just got sick of it before it really caught on. I dont know, I dont think there is anything wrong with the ads. Despite various opinions on how well or horrible the outfit works on her, I think the images are really striking and would definitely make someone stop flipping through the magazine and stare. Isn't that what advertisements are supposed to do?